A perfect alternative to massive poetry anthologies, this brief, affordable collection of over 250 poems provides a concise yet comprehensive introduction to the study of poetry. Authors new to this collection, including Amy Gerstler (named by the Los Angeles Times as “one of the best poets in the nation”), and award winners Rebecca Foust and Craig Arnold, provide ample evidence that poetry continues to flourish in today’s world. Young writers Ernest Hilbert and Erica Dawson bring poetry into the 21st century and provide inspiration for aspiring young poets. 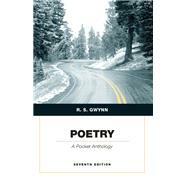 R. S. Gwynn has edited several other books, including Drama: A Pocket Anthology; Literature: A Pocket Anthology; Literature: A Pocket Anthology; Inside Literature: Reading, Responding, Writing (with Steven Zani); The Art of the Short Story (with Dana Gioia); and Contemporary American Poetry: A Pocket Anthology (with April Lindner). He has also authored five collections of poetry, including No Word of Farewell: Selected Poems, 1970-2000. He has been awarded the Michael Braude Award for verse from the American Academy of Arts and Letters. Gwynn is University Professor of English and Poet-in-Residence at Lamar University in Beaumont, Texas. What’s That Smell in the Kitchen!